JACQUES CAUVIN • Centre National de la Recherche Scientifique, Institute de Prehistoire Orientale, Jales, France. Science," and an epistemologist such as Feyerabend (1979) does not hesitate to suggest that today's science may be tomorrow's fairy tale. This is why, in the 1980s and 1990s, through the impetus of Ian Hodder and a few others, the school of "symbolic" or "contextual" archaeology reacted against this systematic reductionism by advocating a more interpretive and herme-neutic approach (Bintcliff 1991), to the point of considering not only the ritual documents (funeral practices and art) but the artifacts themselves, their decoration, and the architectural structures as "symbols"of an underlying way of thinking to be reconstructed. While a fruitful approach, in practice prehistorians have focused on that nature of social structures, in particular the first hierarchies of the end of the Neolithic and of the Chalcolithic foreshadowing the urban revolution (Hodder 1989). What about the earlier Neolithic, before societies with elites? Hodder's interesting ideas (1990) on the European Neolithic can sometimes give an impression of arbitrariness and subjectivity.Arguing that modern science is focused too much on the positivist and behaviorist ideologies that influenced processual archaeology, this does not get in the way of the "new school," whichseekstoberesolutelyrelativist, antiscientific, andpostmodern. The recent brainstorming concerning scientific epistemology itself (e.g., Feyerabend 1979;Kuhn 1977;Morin 1991;Popper 1959)allows that human sciences may be practiced without being necessarily positivist or behavior-ist (Peebles 1992). What is important is to widen the field of the science itself to include areas so far neglected. The advent of "cognitive archaeology" is, for example, one ofthe principal avenues toward which this broadening can occur (Renfrew and Bahn 1991; Renfrew 1994a). Here again, however, ambiguity exists. In principle it is a matter of reconstructing prehistoric "cognition," but in reading the publications related to this trend one realizes that they are more often concerned with analyzing the cognitive methods and practice of the archaeologist in crafting prehistory rather than penetrating the actual functioning of prehistoric thinking. As Gardin has said, "the two programs are not mutually exclusive, but it is not a reason to confound them" (Gardin 1992:99). The problem is, then, to know whether, independently of any reducing positivism, it is possible to have discussion on the prehistoric mentality that is sufficiently rigorous and coherent for a minimal consensus among the scholars of our discipline, an element that Popper holds to be the essential virtue of a scientific theory. The undertaking is a difficult one. There is obviously a danger of projecting on the past our cultural conceptions of the present (Renfrew 1994b), not only in the matter of religion but even for the most trivial activities. One will note, for example, the modern tendency to treat the new food strategies of the Neolithic chiefly in terms of production-consumption, as would a present-day economist. Perhaps it is the same in technology for the French method of "chaînes opératoires," given as an eminent example of cognitive archaeology: just because we observe in a prehistoric technique a rational linkage of gestures and inventions does not mean these were inevitably conceptualized in the same way by prehistoric craftsmen. Technological analysis today is related to that which Popper has called "the world of linguistically formulated human knowledge"; it is a relatively late stage in the evolution of our species. There could, however, have been an unformulated practical rationality that could have been accompanied by "thinking"of a very different nature. Beyond the overly theoretical controversies between "processual archaeologists" and"contextualarchaeologists," weare striving(Cauvin 1994) to combine clearly the various methods with regard to the Neolithic in the Near East. The first step in this process is to construct a classic synthesis on the basis of our own excavations and those of our colleagues, using available architectural, technological, environmental, and subsistence data, then situating these chronologically in relation to other more specifically cultural information, such as art and religious and funerary practices. This multidimensional analysis reveals anomalies that are counter to current interpretive models and allows us to enter into a "palaeopsychological" interpretation of the past, in spite of the somewhat pejorative meaning of the word in the eyes of the new archaeology. Contrary to other regions of the world where the Neolithic arrived abruptly, such as Europe, in the Near East it was an indigenous process, spread over three millennia. Its different components (economic, technological, ideological) occurred progressively in a determined order. This order, which is an irrefutable stratigraphic fact, is in itself significant for it automatically excludes certain explanations since certain phenomena occurred chronologically later than those that they were supposed to have caused. For example, Gordon Childe's argument that the move toward sedentarism was the consequence of food production was undermined with the discovery ofpreagricultural Natufian villages such as 'Ain Mallaha (Perrot 1966a). One of the components of the Neolithic revolution is that which we call the "revolution of symbols," manifested preeminently in Neolithic art. Although there are rare anthropomorphic silhouettes, still schematic and asexual, the great majority of Natufian figurines depict small ruminants (gazelles, perhaps deer) carved in bone or stone. In contrast, two new figures accompanied, and continue after, the Neolithic revolution: the representation of women and of bulls, which henceforth dominated all other representations. These representations first appeared between 10,000and 9,500 bp in the Khiamian culture, intermediate between the Natufian and the PPNA. Female statuettes are found almost exclusively from settlements in the Jor dan valley (Bar-Yosef 1980) as well as on the Euphrates (at Mureybet 11). The theme of the bull, however, was limited to the Euphrates valley and was expressed through the burial of bulls' skulls in clay benches. These devices are obviously symbolic, for very little hunting of the wild bull itself took place. 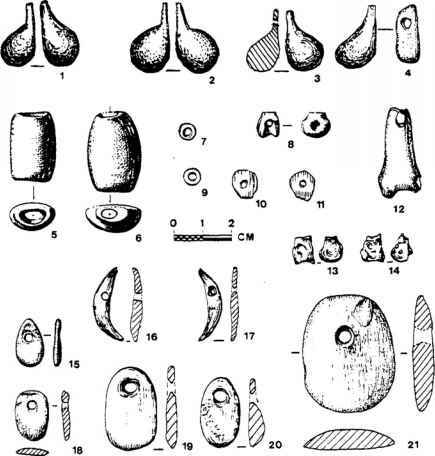 Between 10,500and 10,000bp the earlyMureybetian of the Euphrates (phase IIIA of Mureybet) was to see a proliferation of female figurines in stone and in fired clay (Cauvin 1977, 1994), along with the horns of aurochs imbedded within walls. Paradoxically, there are no perceptible traces of agriculture or of animal domestication. Representation of bulls do not reach the southern Levant until the middle PPNB (about 9,500 BP). These two figures, the woman and the bull, were destined to represent the divine couple, mother-goddess and bull-god, which were to persist in the Near East and the eastern Mediterranean from the Neolithic until the classical period. In the Khiamian and Mureybetian, where we see them emerging as "dominant symbols," they may have already been viewed as divinities. Although we have no formal proof for this early period, 2,000 years later in the Ceramic Neolithic of Catal Hoyuk (Mellaart 1967) this is the case where the monumental representations of the goddess are found on relief on the walls and the well-known statuette depicting the mother-goddess giving birth on a throne of panthers—attributes unequivocally royal and maternal. The obsessive and oversized representations of the bull (frescos and clay bucrania), and particularly a statuette of a bearded man riding a bull, foreshadow the Phoenician and Hittite god Hadad, also represented as riding a bull. But this certainty is based on the abundance, the variety, and, especially the exceptional preservation of the material at Catal Hoyuk, particularly its architecture. Although there is limited information on the subject, the interpretation that the representations of women and bulls in the Near East by 9,000 bp were linked to "divinities" remains a theoretical probability, one that is worthy of further consideration (see also Voigt Chapter 11,this volume). What was the environmental context of this revolution of symbols?The Khiamian period, like the end of the Natufian that preceded it, occurred during the dry climatic episode of the Younger Dryas, which lasted from 12,000-11,50(Bp. At Mureybet, phases I and II (Final Natufian and Khiamian) are both characterized palynologically by the abundance of chenopodiaceae and the relative rareness of tree species and grasses (Leroi-Gourhan 1974). Although the utility of palynological analysis is limited when applied to ells in the Near East, these results are unquestionably confirmed by the dating of the Younger Dryas in the eastern Mediterranean (Rossignol-Strick 1993), as well as the archaeobotanical results (macroremains) from Abu Hureyra situated on the Euphrates, where the climatic dryness began at the end of the Late Natufian ("Mesolithic"), about 12,000 bp (Moore and Hillman 1992). Thus, the change in the symbolic material occurred in the middle of an arid phase. Although it is difficult to say whether there is a connection between the two phenomena, what is certain is that the arid phase and period of food stress occurred much earlier than the appearance of an agricultural economy which was not linked to climatic stress. In fact, the Khiamian diet was no different from that cf the Final Natufian: at Mureybet it was a broad spectrum economy where the gathering of Polygonum (with some wild cereals), the hunting of gazelle and small game, and fishing were predominant. The first traces of agriculture, contemporary with an increasingly moist climate throughout the Levant, did not occur before 10,000 bp, as seen in the PPNA (Sultanian) of Jericho and especially Tell Aswad (Aswadian) in the oasis of Damascus. For these two villages, the morphological "domestication" of cereals has been proposed, but continues to be debated. At Netiv Hagdud (Bar-Yosef et al. 1980) in the Jordan Valley, the "domestication" of barley is only partial, which has led to doubt on the part of some archaeobotanists (Kislev 1992), though not of others (Zohary 1992), as to the presence of true agriculture. On the Middle Euphrates, the agricultural economy appears to be established at the same time as phase IIIB at Mureybet (Late Mureybetian), but in an entirely predomestic form, indicated by a strong and sudden rise in the quantity of cereals probably due to artificial human intervention. Here, again, debate exists (Van Zeist and Bakker-Heeres 1984; Willcox 1995). It should be noted, however, that G. Hillman's proposed "pre-domestic phase" has been demonstrated through experimental prehistoric cultivation at Jales (Anderson-Gerfaud et al. 1991). Moreover, the selection for domesticated cereals could have been delayed if spontaneously sown seed was not kept apart from cultivated seed. The exact content of this first agriculture still remains to be defined from an archaeobotanical point of view, but a first phase of a more active management of the environment is certainly supported by the deliberate selection of certain species (cereals among them) requiring increase in technical investment, whereas other resources were abandoned (Cauvin 1977, 1978). At Mureybet III, we see the end of fishing and a progressive decrease in the hunting of gazelle and small game, replaced by the hunting of large herbivores (cattle, equines), which becomes dominant (Ducos 1972). Interestingly, this pattern indicates that this new economy was not the reaction to a lack of food resources, such as proposed by Flannery and Binford, but a deliberate cultural choice previously suggested by Braidwood. This choice caused the human settlements to enlarge quickly; Mureybet and Jericho grew to larger than 2 ha. There were then local demographic increases, in contrast to the small settlements of the Natufian and the Khiamian. As Flannery suggested (1972), such an enlargement necessarily implies a new type of social organization and probably led to the collective construction of monumental buildings such as the PPNA tower of Jericho and a general reorganization of food strategies. But this new organization, whose exact nature is still quite difficult to define, was not a reaction to an environmental stimulus, for as we have seen the environment was not over-exploited but, on the contrary, abounded in unexploited resources. This is definitely not adaptive behavior in Binford's sense but an adaptation of human society to itself and to its own maturing process. Since it was not an environmental stimulus, it must have been cultural. Thus, it is necessary to look for the reason for these changes in the "interior environment" (Leroi—Gourhan 1965). We have seenthata spectacular change has already occurred that foreshadows the economic upheaval to come: the Khiamian revolution of symbols. Moreover, given that this chronological sequence is now indisputable, it is necessary to challenge and dismiss former materialist theories in which symbolic constructions were only derived "superstructures." We must note, however, that the true logical links between the two events, that of ideology and economy, are not a priori obvious. We have thus presented a theoretical explanation for this relation between reli— gious beliefs and economic and sociological changes (Cauvin 1987,1994).